Colton Fire Chief, Richard "Beau" Beaudoin said, "On Thursday, Nov. 29, firefighters from the Colton Fire District responded to the 20000 block of South Green Mountain Road for a reported car fire. "On arrival crews found a full-sized trailer on fire with a shop approximately 20 feet away. The crews quickly knocked down the fire and prevented it from spreading to the shop. Prior to the arrival of the fire department a family friend had attempted to put the fire out with a garden hose. While this is not recommended for citizens to get that close to hazards and take those risks, the gentleman was able to get enough of a knock-down to buy some time until fire units arrived. 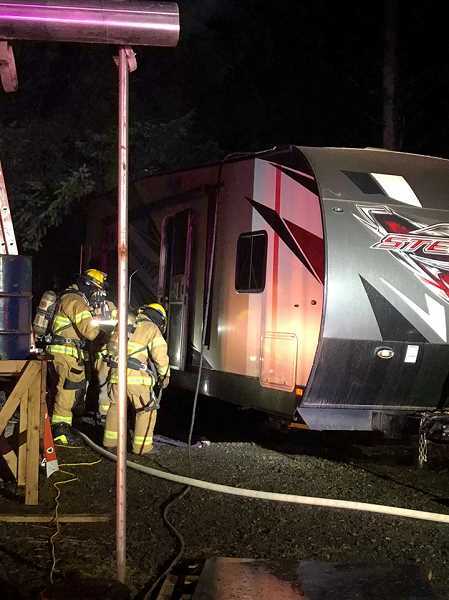 The family also removed propane tanks that were attached to the trailer which could have been hazardous to the suppression efforts," the chief said in a press release. "The kids and I were in the house," property owner, Deawn Seals said. "I heard Ty (Debban) give the kind of yell you know is a bad situation. When I looked there were flames coming out of the roof of our toy hauler and our neighbor, Greg (Red) Ault was already over with his hose wetting it down and keeping the fire from spreading to the shop." The shop houses Debban's fabrication business, Tor Fab. There was no damage to the shop, but the trailer is a complete loss. Seals said, 16-year-old daughter, Hailey, also, stepped in to help with hoses. Seals said a space heater that was in the trailer must have gravitated closer to the trailer wall during transit. The heater that was now next to a wall, was still plugged into the socket and when the family got home they plugged the trailer in to an electrical outlet to recharge the batteries. The heater came on and approximately 24 hours later the trailer was in flames. "But the good out of this stressful time is our local fire department," Seals said. "They were amazing in their quick response and their friendliness. It was a display of their passion to help others and the dedication they have to their training. They don't get paid for all the hours they put into drills and the hours of training and education as well as responding to emergency calls. The volunteers do this to serve our community. They were amazing and because of their professionalism, I was able to contain my fears." "The fire is believed to have been started by a heater that was too close to a wall," Chief Beaudoin said in a letter to share with the community. "This should be a friendly reminder that space heaters account for 43 percent of home heating fires and 85 percent of associated deaths. Space heaters should be attended [to] at all times, located no more than three feet from any objects that can burn and avoid using a power strip and placing it on carpet. Have a safe and happy holiday!"